Successfully Added 4K Ultra HD Action Wifi Camera - Dual Display (2 + 0.95 Inch), IP68, 12M Sony Sensor, 170 Degree Angle, Remote (Silver) to your Shopping Cart. Wide angle lens to capture all the action. Can you find many Wifi Ultra HD action cameras at this price? It's an affordably way to make your adventure look great. Seriously, 2160p is pushing pixel rates to the max! Use this awesome quality 12M Sony Sensor camera to inspire you for your next adventure. Plus it shoots at 30 FPS, which is better than the standard for video to film operations, giving you a lot of cool freeze frame options as well. What is the point of the Wifi function? You do not need any cable and can easily move the videos from the camera to your phone, tablet or PC where its quick and easy to share online with friends. 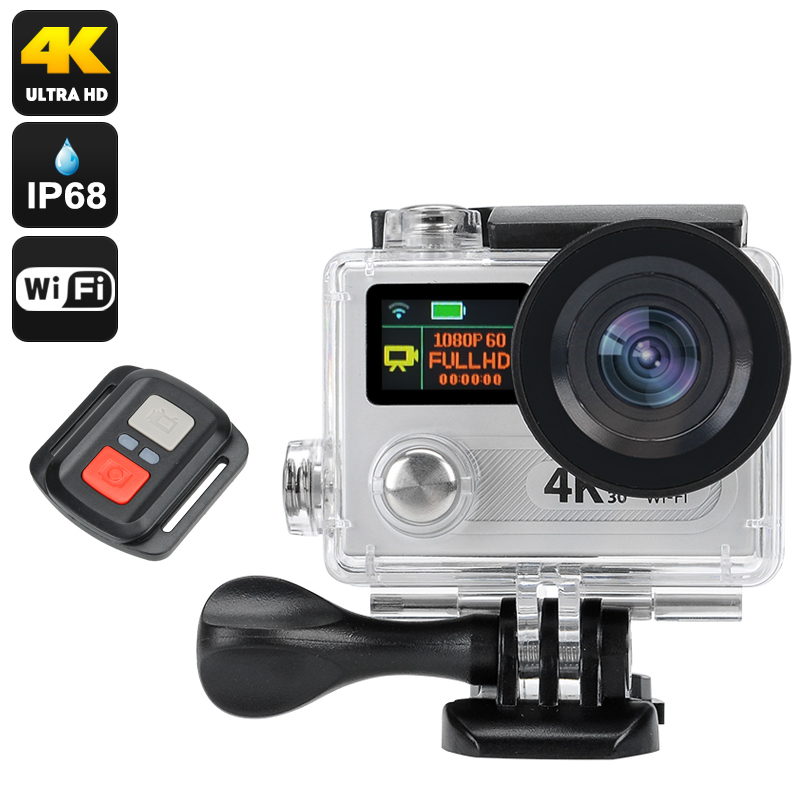 Designed with outdoor pursuits in mind it comes with an IP68 waterproof case that's rated to 30 meters and has a full range of attachments for bikes, helmets, harnesses. Thanks to front and rear LCD screens, being the family photographer no longer means missing out on the action. 2 inch high definition back screen that displays and replays recorded videos, front 0.95 inch color screen shows camera mode and battery power. With the remote control function, you can capture actions and record videos through your watch style controller. It lets you wirelessly start and stop the recording from up to 20 meters distance. This 4K Ultra HD Action Wifi Cameracomes with a 12 months warranty, brought to you by the leader in electronic devices as well as wholesale Sports Cameras..